The aim of the present study was to assess the somatosensory function in the peri-implant soft tissues in the anterior jaw bone by means of two psychophysical tests. Light-touch sensation (LTS) and two-point discrimination (2PD) were performed before, and at planned intervals until 18 months after the placement of one or two implants in the anterior maxilla. The same tests were used on the contralateral control sites. The psychophysical threshold was determined by performing the staircase method. The mean values and standard deviation of LTS and 2PD, pooled over the four sessions at each test area, were calculated. Despite a large intersubject variation in both the LTS and 2PD, significantly high intra-individual correlations were found (P < 0.005). For LTS, the thresholds were not significantly affected over time (P > 0.05) on both implant and control sites. The 2PD increased significantly after surgery and maintained the higher discriminatory sense for 1 year (P-value 0.005). The control sites remained stable over time. However, no correlation was revealed between LTS and 2PD perception (Pearson correlation test). 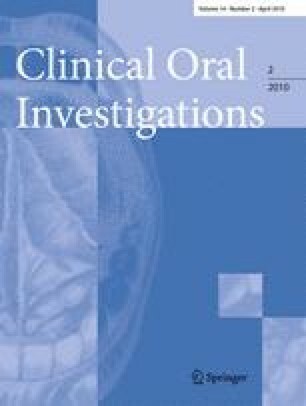 In this prospective study, no major differences between the different sites and testing sessions were reported; except for the 2PD thresholds which were lowered after implant surgery. These findings suggest that the regenerated nerves may be responsible for the increased 2PD sensitivity in the peri-implant soft tissue. The unchanged LTS thresholds did not allow confirming this hypothesis.